Today marks a very special occasion as we honour and pay tribute to 100 years of T.K. Whitaker. In today’s Irish Times, I write about why Whitaker’s work is as relevant as ever to today’s Ireland. And at the Whitaker Institute, leading academics speak about Whitaker’s legacy. And there is this great video from the Central Bank of Ireland celebrating 100 years of Whitaker. Breithlá Sona! TK Whitaker deserves to be celebrated today and together with Joseph Brennan (1887–1976) of my hometown of Bandon and James J. MacElligott (1893-1974) of Tralee, these men have been the giants of the Irish civil service since 1922. Frank Barry of Trinity College has argued that the impetus for radical change in the 1950s initially came from the Dept of Industry and Commerce which 60 years ago this month resulted in the genesis of the low tax strategy. World Bank data show that of 101 middle-income economies in 1960, only 13 became high income by 2008. Ireland & Japan were among the 13. However looking ahead, we have to recognise that depending on ready-made overseas jobs results in little significant research activity in Ireland and a per capita standard of living that is below Italy’s despite the latter’s almost 20 years of stagnation. Now with challenges like Brexit and changes in international tax rules, we have to confront structural problems such as a very low number of export firms and one of the lowest business startup rates in the EU. Although Whitaker’s legacy is huge, thank you for for pointing out that Ireland has had more than precisely ONE civil servant of note over the last 100 years! The media (and many historians) persist in their early canonisation of Whitaker because they are generally too lazy to engage in serious research into Ireland administrative class. On the other hand, Irish bureaucrats are a reticent bunch too. Still, this piece by John McManus is about as deep as it gets in terms of media analysis of the civil service (http://www.irishtimes.com/opinion/john-mcmanus-why-don-t-we-make-tk-whitakers-anymore-1.2898038) with the rolling-out of a 25-year-old anecdote the closest thing to a data point in 750 words. 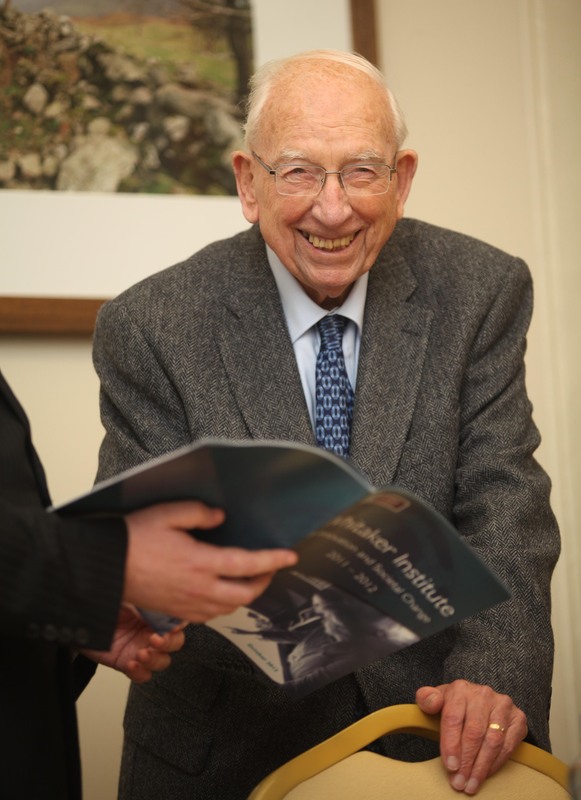 TK Whitaker fully deserves all the plaudits and good wishes that will come his way on this occasion. Having the most unequal distribution of market (pre-tax and welfare transfers) income in the OECD (mainly due to pervasive and publicly authorised rent extraction) – which in turn reinforces inequality in wealth leading to gross inequatibility in the provision of housing and sheter, relying on a massive re-distribution of income via the tax and welfare system to generate an averagely equitable post-tax and welfare distribution of income, having this massive re-distribution squeeze the resources available for the delivery of generally poor quality public services should provoke even more public disgust and anger than can be observed in other countries. But it doesn’t. Similarly to the 1950s it seems to be a case of the dog that didn’t bark. The water charge protests of Oct. and Nov. 2014 were the only hint of justified public disgust and anger. But there is increasing evidence that a huge reservoir of such disgust and anger is growing just below the surface. Two paragraphs flogging your favourite hobby horse in a manner that would attract the Stewards. Oh, Tull, you can’t imagine the relief we’re feeling. We thought we’d lost you. Sometimes history rhymes. However much the well-heeled rent extracters might deny it the case for a policy revolution similar to the one TK Whitaker initiated almost 60 years ago is compelling. It would be far, far better to tackle this constructively rather than delay until public disgust and anger boils over. Sadly, we have no one of his calibre to drive the initiative. Even if we had, it would be unlikely to work this time. The modern manifestation of the forces of resistance which Lemass was forced to tackle are much, much more resistant to any changes. It would be wonderful if we had some politicians with the guts and the gumption, but, again, sadly, we don’t. And as for the opinion formers who enjoy media platforms and our “public intellectuals”…..
A truly magnificent career and a century of real achievement; an exemplar of patriotic public service in the finest of republican traditions. Breithlá Sona! Oops! The +1 is in agreement with Tull on P. Hunt’s poor taste … get a life Paul! It’s nice to be able to recognise and applaud a great man. Thanks too to Mr. Whitaker’s parents, who seem to have raised someone with both values and capabilities. I’d rank him alongside John Hume as the greatest men to come from N. Ireland in the past century. I was in attendance when he came to speak at Queens University in the late 60s. It was a full house and even then it was clear that the more moderate and business-oriented section of the unionist population thought he was a nationalist they could work with. If his advice had been listened to, there would have been no Troubles and partition would be long gone. Unfortunately it wasn’t and N. Ireland erupted a few months later. With regard to his formulation of an economic plan for the Republic in the late 1950s, he benefitted from living in a less cynical, more patriotic (in the good sense) and more religious era. So, his economic plan captured the public imagination. Nowadays it would have been disparaged and ridiculed by the commentariat and the twitteratti, I can just imagine this site in those circumstances. There would have one or two posts supporting his plan and a few hundred ridiculing it as far-fetched fantasy. He was ripe for his time when things opened up in the 1960s. The reality is that the (hardline-Tory) UK government and the N. Ireland government (under Lord Brookborough) in the 1950s were extremely hostile to Irish nationalism and to the idea of an independent Republic of Ireland. They wanted it to fail. This was partly because the events of 1916-22 were still in the living memory of political leaders, with feelings exacerbated further by the events of 1939-45. This was the era of rampant economic discrimination against nationalists in N. Ireland, which the Belfast and London governments actively promoted. This was the era of ‘No Irish’ on ads for jobs and lodgings throughout England. There was no way they’d have agreed to opening up trade between Britain and Ireland if it shifted the balance of advantage on the island from north to south. It takes two to tango and putting all the blame for the Republic’s relative isolation at the time on Ireland’s political leaders is wrong. Relations improved greatly in the 60s when, firstly, Brookborough was replaced in 1963 by Terence O’Neil, who was much more in favour of developing trade with the Republic, and, secondly, when the Tory government was ousted by the Harold Wilson-led Labour government in 1964. He was much more friendly to Ireland. This was when Dr Whittaker came into his own. The signing of the Anglo-Ireland free trade agreement quickly followed, in which Dr Whittaker played a big part. But, its foolish to think such a development would have been possible a decade earlier. Not true but it was not surprising given the gloomy backdrop and the time for policies to show an impact. In the 1961 general election FF lost 7 seats and 4.5% of the vote to 43.8% while Fine Gael gained 5.4%. Two years later the visit of JFK was a huge boost for Ireland in the US. I think you will find that FF remained in power for another 12 years after the 1961 election (on top of the 4 preceding the 1961 election). In total FF were in power for 39 of the 50 years after the 1961 election, a dominance that has few equals in postwar Europe. Being in power at the time Dr Whittaker launched his economic plan, and thereby being given the political credit for its initial and enduring success, was probably a major factor in this dominance. Had FG been in power in 1958-61, they’d probably have gone on to dominate. Luck of the draw. By the time I went to Queens University in October 1966 the perception that the Republic’s economy had taken off was widespread in both communities and there was growing support for economic reunification (which would inevitably have been followed a couple of decades later by political reunification). It was this that triggered public acclaim for the Lemass/O’Neil meetings (unprecedented at the time and which Dr Whittaker was instrumental in organising) and led to initiatives like the all-Ireland electricity grid. Unfortunately, not long after the crazies in the UVF/UDA, the IRA, and the British army, set back things for a generation. I think we ought to reflect on the huge danger that so much of what Ken Whitaker stands for is now under threat from: the move towards inward-looking protectionist economic policies in the USA, and the whole Brexit phenomenon. We also need some clear headed leadership that openness without redistribution doesnt, it seems now clear, last for ever. We have proportionately more income redistribution than any OECD country – mainly because we have the most unequal distribution of market incomes and end up not far off the average for the distribution of post-tax, post-transfer incomes. And, partly as a result, we end up with a very high proportion of households withput anyone in work. But that’s the basic political settlement – and woe betide anyone who questions it.